Christy Recommends: Complete the look throughout your bathroom with the Prism Towelling Bath Mat. Made with 100% Turkish Cotton with sheared border, 550 GSM. Received within time given. Very pleased with quality and colours accurate. Sizes generous. Have not laundered them yet. Purchase was to add to my existing towels. 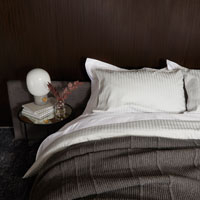 5 star rated because of their density, absorbing ability, softness and brilliant colour. Good quality bath towel - blackout black it really is. 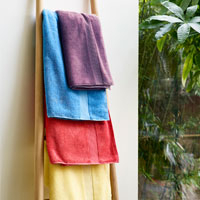 Beautiful towels both quality and colour. I had expected this to be a plush guest towel - but it’s very ordinary. I have the other size ranges, so made sense to have them all. They are massive. Lovely and soft. All the towels wash up lovely,at 40 degrees,as opposed to some where it needs 60 degrees. Fully recommend if you want quality and softness. They make you feel cosy and warm. The towels are beautiful and luxurious. The colour is just what I wanted and the quality is as good as I expected. Excellent quality, great colour, thick and lovely. All the items are a Xmas present, but pleased with them all so far. Great product. Great service. Will definitely use them again. I had already bought (one of each) bath sheet, hand towel and face cloth in the Absinthe colour, together with two bath mats. But the bath mats were rather small and looked a bit lost in my bathroom so I bought another one to go with them. Looks much better now. Gorgeous colour. Too thin to absorb wet feet without going through to the floor. Ordered and delivered went smoothly!! A very high quality product. Can't beat Christy towels. Wash well and are absorbent. Just what I needed great quality and colour. Beautiful towels. Perfect colour wadj lovely too. All fantastic, as previously stated! These are luxury towels!! Gorgeous colors and they wash beautifully. A very pleasing addition to my bathroom. Excellent quality, vibrant color, wash es beautifully. Lovely colour and thick mat. Excellent size, colour and quality. 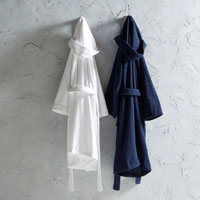 I love Christy towels and have used them since the 1980’s. The colour is perfect! Great quality too. Lovely absorbency for using as a kitchen towel. Fabulous colour and quality! Excellent size for wrapping yourself in after bathing. Great quality and colour too. Seems good quality - not used yet. Thin towels. More like beach towels. Towels feel good quality and will look forward to using them. They are big for a bath towel, but I suppose it depends on the persons size! A good size, even big enough for my 6ft husband! Very good quality and design - proud to have them in my bathroom! I had expected towels from Christy to be more luxurious. They were disappointingly ordinary. Towels are much thinner than I was expecting. I was expecting my purchase to be towels of a higher quality. Again the towels are disappointing as I was expecting more luxurious quality towelling. Works very well for drying hands in the kitchen. The hang-up loops are really convenient to use. Beautiful colour and fine quality fabric. With this product, you earn up to 420 loyalty point(s).